The hardware of this matches Part II but it has the multigame add-on fitted. Not worked on a Space Invaders board before and needed to make up a loom so I could properly test. The owner says the ship is constantly pulling to the left and there is a sound effect playing over and over all the time. On powering up I did indeed find these problems. Look at the video, the in game play shows me moving the ship to the right but when I release the controls it moves back far left on its own. You can also hear the constant tone repeating over and over. First of all I went looking for the control issue. The schematics are available however they aren’t too great in places. Fortunately they were good enough to save me a lot of time. From my logic probe I could see that this output is stuck when it should be active. Testing this out of circuit confirmed it. This fixed the control issue . Now on to the sound fault. Space Invaders hardware made this quite easy as each sound effect has its own volume control. By turning the pots down I could pinpoint which sound was stuck on and work back from there. VR7 was the pot associated with this sound and according to the manual this is the sound of the “UFO HIT”. 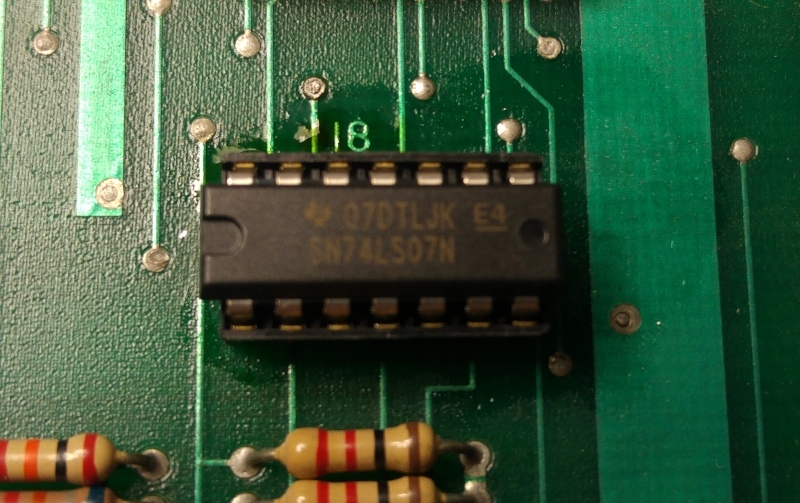 Looking at the schematics again and working backwards we can see it goes back to buffer chip 7417 at location 18 and before that it comes from a 74174 at location 14. The outputs from the 74174 looked good but all the outputs from the 7417 buffer were stuck HIGH. I removed the chip and once again it failed when testing out of circuit but now I had problem. I dont have any 7417 chips and I no longer have scrap PCB’s lying around. 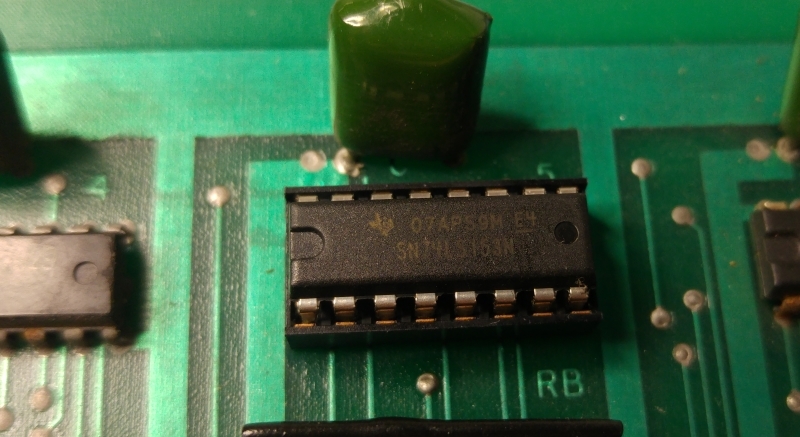 The sadness was short lived as a quick google search revealed a 74LS07 chip can be used as a replacement and the difference between the two is the 7407 is rated for 30v where the 7417 is rated for 15v. Anyway, replacing this with a 74LS07 worked and the sounds are all OK. The video shows the controls now working and the lack of annoying sound. I did actually test the UFO HIT sound in game and it was working fine.